Happy Friday blog readers! I can't believe how fast the weeks are flying by and that we are almost to the end of February. It will be spring before we know it! At least that's what I keep telling myself as I sit and shiver in my freezer for a bedroom. We have been making awesome progress on the house this past week which means I'm due to write up another update for you guys. But for today, I'm keeping it simple and sticking with an easy Five Things Friday post. 1. I've been playing around with new hairstyles, since one of my 16 Goals for 2016 is to come up with a new go to hairstyle. This was one I tried last week and felt especially cute. Although it only works for not freshly cleaned hair, since it needs to be a bit calmer if I'm going to leave it down. Oh the joys of thick frizzy hair. 2. Dan bought me Lego for Valentine's Day (because he's the absolute best) and I've been having so much fun playing with it and building houses. I may still be a kid at heart. 3. I bought myself a cute little red teapot for $4.99 last week and am so delighted by it. Even though it's pretty useless since it only holds one cup of tea, I still love pouring myself some tea out of it. It's just so cute, wouldn't you agree? 4. We bought ourselves the game Ticket to Ride and are so excited to try it out soon! We borrowed a different edition from a friend before splurging on it (it was $70) so we haven't actually played the original version yet. It is probably our new favourite game though. 5. Our powder room is almost done!!! <--- Yes that needed three exclamation marks. I painted it earlier this week and Dan put in the tile last night. Hopefully we can grout tonight and then maybe have a functioning bathroom on the main floor by the end of the weekend! Oh and I am still totally in love with my tile choice. So so beautiful. Aren't Friday's fun? I hope you all have a great weekend and I will do my best to get a house update post up for you all next week. Like I said in my last post, I feel like it's time for some good ol' food blogging. Because let's be honest, renovation updates can get a little tedious if I don't throw in some other random fun posts here and there. So to keep you on your toes (and because this recipe is amazing), here is a post about muffins! As I have mentioned before, muffins are the bomb. I pretty much always have muffins in my house because a) they're easy to whip up, b) they freeze well and c) they taste so dang good. They're my ideal snack because they are filling and relatively healthy. My sister Cora gave me this recipe for banana blueberry muffins so that I could make a bunch for her wedding. They are vegan and since her wedding was completely vegan, they were the perfect muffin. After making them for the wedding and seeing how good they turned out, I decided I needed to try making them gluten-free for myself. I used my magic flour (seriously, best GF flour mix ever) and they turned out absolutely perfect. It is called Cuisine L'Angelique and if you live in the Eastern Townships in Quebec, you can probably find it locally. But if you don't live in that area and want to give it a try, they sell some of their stuff online. I mainly use the All Purpose Flour mix but the other baking mixes that I have tried have all been delicious. There are only eight ingredients so these muffins are a breeze to whip up. All you need is bananas, oil, vanilla extract, sugar, flour, baking soda, salt and blueberries. That's it, easy peasy. You mix together the mashed bananas, oil, vanilla and sugar and then add in the dries. You can use either fresh or frozen blueberries, but considering that it is the middle of the winter and fresh berries aren't really in season, I choose to use these lovely little Canadian grown blueberries I found at the local grocery store. Once everything is mixed together, you spoon the batter into a lined muffin tin and then bake! Oh and important note here: to keep the muffins nice and moist, you need to have an oven safe dish filled with 1-2 cups of water sitting in the oven while baking. I haven't actually tried it without the dish, but I was told it was important so I'm not going to risk not doing it. Now as for how long to bake them, the recipe says 20 minutes but I find it takes closer to 40. I'm thinking this is because I use frozen blueberries so it takes longer to heat through them, which means that using fresh would make the 20 minutes more accurate. So I recommend just keeping an eye on them and using your own judgement. Ready for the recipe? Before I give it to you, here is a disclosure. Cora can't remember where she got this recipe so I can't actually give credit to anyone. I just want you to know that I did not come up with it and if anyone knows its original source, please let me know and I will link it to them! Mix bananas, oil, vanilla and sugar until nicely creamed. Add in dries and stir until just mixed. Fold in blueberries and spoon into lined muffin tin. Place 1-2 cups of water in an oven safe dish and place at back of oven while baking, this helps keep the muffins nice and moist. Bake for 20 minutes at 325 degrees Fahrenheit. If using frozen blueberries, it will take longer (closer to 40 minutes) so keep an eye on them. When done, let cool on wire rack. Enjoy! What is your favourite muffin? These are definitely winning lately but I also love strawberry rhubarb ones and anything with chocolate. Well folks, I didn't think it would get worse, but it did. My house is even messier than it was in my last post. Okay, so maybe I am exaggerating a little bit but it does feel like the mess has now spread itself out. I kind of had it contained to a few rooms before but now it has taken over the living room as well. Our bathrooms are still in the mudding and sanding phase, which is the worst job ever. Fortunately for us, a friend/neighbour is giving us a hand with it so we have more free time to work on other projects. What new projects did we take on? Well if you follow me on Facebook, you'll know the answer to that. We took down the wall separating the kitchen from the living room! The difference between having the wall and not, night and day! Seriously, best.decision.ever. It is so much lighter and open and fabulous. I pretty much smile every time I walk out of our bedroom and see it again. 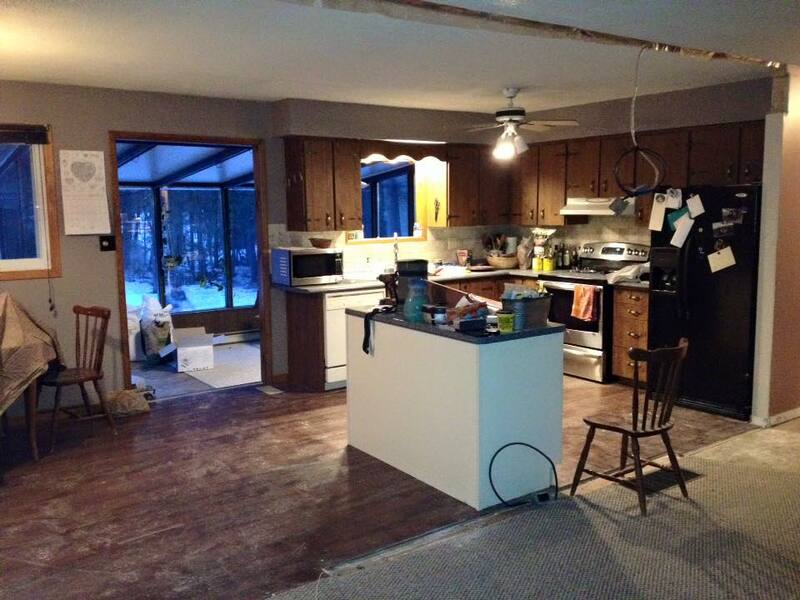 We have plans to update the kitchen too, but all in good time. For now, the wall is gone and there is natural light again. While we were on the demolition roll, we also decided to remove the closet from that back spare bedroom (the blue room). We are rearranging the layout of that room so this awkwardly placed closet (too close to the door) had to go. We put it back in on the other end of the room, along with the new master bedroom closet. I know this may all be a little confusing for you, but it's hard to explain in a post. At least this post. When I do the final reveals of a room, I'll show more of the process on how we got there. You know, more specific and detailed for each room. As you can see from the above photos of the spare room, we also took up the carpet. We opted to leave the carpet in the master bedroom (the purple room) for now, since that room was still so full of stuff. See below for proof. All the floors are a disaster. Our house is now strictly a shoe house. Slippers won't do, shoes are the only option. That or steel toed boots. I've also given up on cleaning, there is just no point. The kitchen and our current master bedroom/living space are the only places I really put any effort into. And even those rooms don't get clean floors. Like I said, it's a shoe house now. The basement is still pretty much the same as it was. Although I did move some boxes down there when clearing out the spare bedroom. That pretty much sums up what we are living in right now. Like I said, it's a mess and there are so many projects going on at once that it's hard to write specific and precise blog posts. I will try and do better with it though, moving forward. I'm thinking a food related post might be a good idea soon. 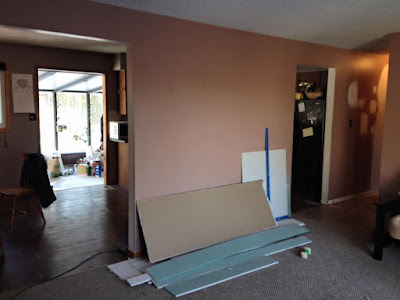 I don't want everything to be all about the renovations, although it's hard not to be when that is pretty much all that is going on in our lives. We'll see what happens. And that's okay. At least that's what I keep telling myself. I'm quite aware that it's perfectly normal to have a messy house shortly after moving and even more normal when going through some major house renovations, but still, I'm having a hard time with it. You see, I'm used to having a pretty clean house. As in, clean and tidy and not too messy. Yes I am human and my house isn't always spotless, but since we don't have kids, it's easier to keep it looking good. But now here I am, in a new house, with drywall dust everywhere and piles of boxes in every corner. Sigh. I know I need to just accept it and make the best of it and keep chugging along, but some days that is easier than others. Anyhow, I thought I would share a few shots of our messiest rooms to give you a peak into what the behind the scenes of a renovation project looks like. Although it does inspire me to go and work on these rooms in order to make them a little more organized in their mess. In fact, I plan on moving some stuff around today in order to prepare for our next project. Because there is never a dull moment in this house! P.S. I hope to have another bathroom update ready for you guys soon!